What is an Ambulance Chaser? 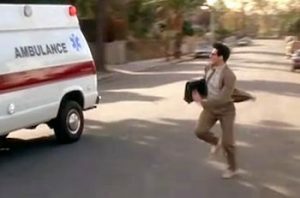 Basically, the term “ambulance chaser” is just a colorful reference to a personal injury lawyer. It is most often used derogatorily when referring to the branch of lawyers who spend more time chasing clients down for potentially frivolous lawsuits, rather than building a deeper client base on reputation alone. If a lawyer is actively searching for retail workers who tripped and slipped at work and got a nasty bump on their head, then that lawyer is an ambulance chaser. Although that might not seem so bad from outside looking in, other lawyers will know the difference between a guy who really knows what he’s doing and wants to make a difference versus a guy who just wants to make a quick buck before he heads home to a TV dinner and his Xbox. Ambulance chasers make most of their money based off a percentage of the damages won in court. Granted, that means they have to win some of the time, but make no mistake: you’re better off finding a lawyer who means business and knows how to play the game for real. Ambulance chasing is more about laying a trap for big companies using someone who might have a bone to pick, but not always. Let’s say you were in a car accident. You needed to alert the authorities and your insurance company because there was some damage done, but no one was really hurt as a result of the collision. Information is a commodity, and yours is a matter of public record now that you’ve been involved in the accident. If you weren’t at fault, you might find yourself contacted by a lawyer who seems to know a little too much about what happened during the accident. If that person tries to send you to see a medical professional for a free evaluation of your proposed injuries (even though you might say you have none), then you’re the target of an ambulance chaser. There are regulations in place that try to prevent these people from getting hold of your information, but people still find a way to slip through the cracks and get what they need. Many law enforcement agencies will redact a lot of your information as a courtesy to you, but something might still give away what happened and where. It’s not a difficult task to find out who was involved. Real legal professionals already have a hard time gaining public trust. It’s extremely difficult to change a perception when it’s so firmly ingrained into the public mindset, and most of us already feel that lawyers are in it only for themselves. The reality is that most of them do a lot of extremely hard work to get where they are, and the pay isn’t what most of us think it is when compared to the costs of their education. Ambulance chasers aren’t just a public nuisance–they’re a focal point of dread for other lawyers. For more information feel free to visit our website!